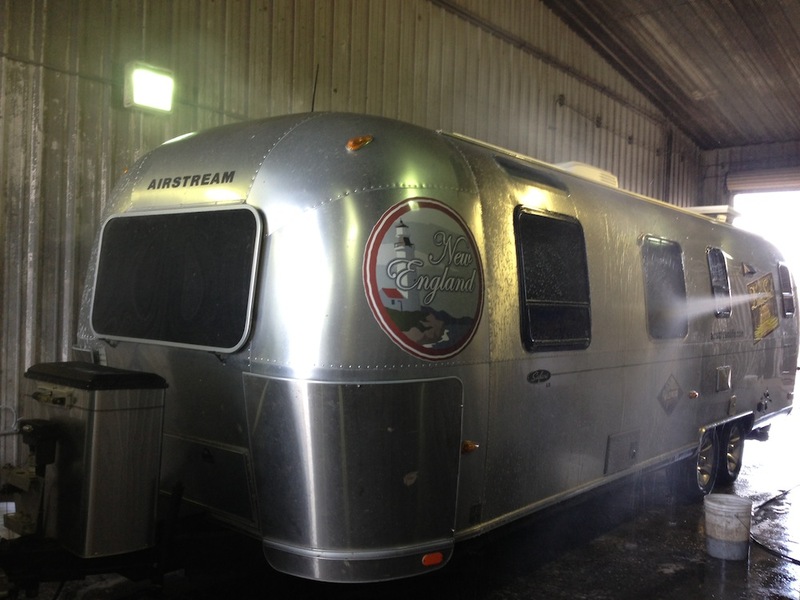 Our countdown to the summer-long trip is into the single digits now, and so it is time to run the “Airstream systems check.” This is a routine that I started integrating to our pre-trip prep about a year ago, after we had to cancel a long-awaited trip because the brake actuator died while the Airstream was stored. Although that situation was sort of a fluke (the actuator was part of a run of bad units that were later recalled), it demonstrated that we can’t take our Airstream for granted. It is almost nine years old now, and has seen heavy use. This spring I’ve been going through the areas of the rig that have shown wear. Through a process of refurbishing, repairing, and updating it has been put back into good shape, better in some ways than it has ever been. In addition to all the stuff I’ve blogged, a few smaller projects got done in the past week. For example, I added LED light strips to the under-bed area. These turn on automatically when the bed is lifted, thanks to a magnetic switch. It was a surprisingly painful job, because I had to squeeze myself into the front storage compartment to connect wires, but worthwhile because before we never could see well when rummaging around in that storage area. While moving the backup camera I discovered a second main ground wire, hidden inside the rear bumper compartment. This one was also somewhat corroded, despite being a bit more protected, so for good measure I disconnected it and cleaned it up as I had the front one. I also lubed all the locks and hinges with graphite, replaced the two big zerk fittings on the Hensley (they have special spring-loaded plungers that tend to wear off), replaced a bad cabinet spring latch, and other such simple stuff. Since we’ve fiddled with the flooring, furniture, plumbing, windows, antennas, camera, hitch, belly pan, refrigerator, bathroom sink, and microwave in the past couple of months, it seemed especially important to do a good road test before we hitched up for the real thing. I recruited Mike, and we towed the Airstream down to the local highway truck stop, the TTT. A good local truck stop can be a boon. At the TTT we were able to get months of desert dust and last summer’s bugs finally washed off the Airstream, then go around to the CAT scale to get weighed (and re-weighed after adjusting the weight distribution a little), and on the way there and back were had opportunities to check the brakes and dial in the hitch head adjustment on the Hensley. (This latter adjustment is crucial, as an off-center hitch head will cause the trailer to push the tow vehicle off-course in a hard braking maneuver. We only had to do this because we disassembled the hitch for painting, otherwise it’s a “set and forget” item.) If we’d been in the mood we could have topped up the diesel and had lunch at Omar’s Highway Chef, too. Mike kept the ladies at the TTT front desk entertained while I went through the CAT scale. The report told me that the Airstream was lighter than it has ever been when loaded for travel with full water, at about 7,260 pounds. It has run as high as 7,800 pounds, but usually less. We haven’t yet finished loading some of our stuff, so when we leave it will probably be right around 7400-7450, which is fine. The road test to and from the TTT verified that the new position of the backup camera is awesome. With the high mounted position I now have a clear birds-eye view of the traffic situation behind us—three lanes wide. I’m going to really like that when we get into heavy traffic situations like Dallas/Ft Worth. It’s also more useful when backing into the carport. The test tow was about 40 miles roundtrip and it verified that everything seems tight, right, and ready to go. No surprises. Even the new cellular antenna clears the carport entry as planned. And it’s shiny again. So all systems are “go” for launch. We just need to get the crew on board and that should happen by the end of the week. 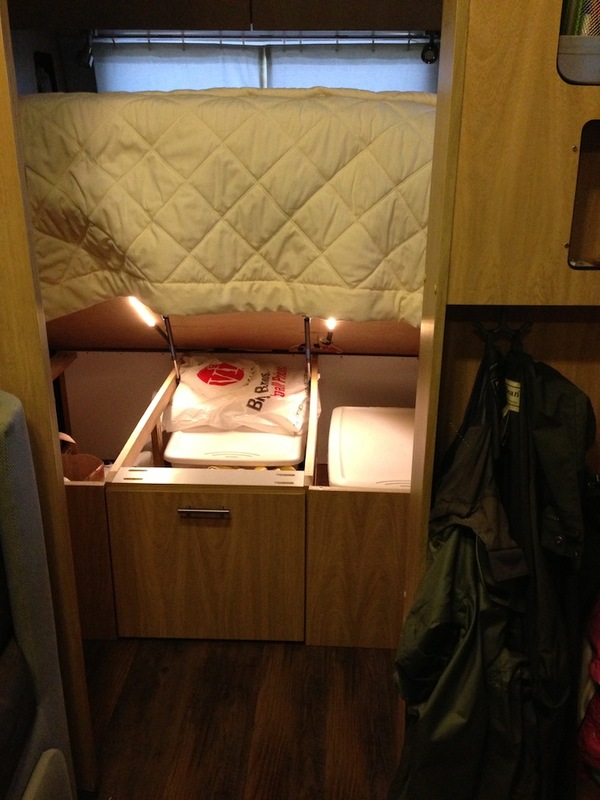 The LED lights (and automatic switch) under the bed are a great idea. We’ve not yet installed in the lower storage cabinets, but have the parts already. thanks for posting the weights of the Cat Scale test. Can you review your technique for hitching with the Airmatic? I have been attaching hitch with engine off doors closed (GL350). Curious to your technique. Ah, yes, an often-asked question. The answer is simple: you’re doing it the right way: engine off, doors closed. This way the Airmatic system isn’t trying to level up while you are adjusting the hitch. This is particularly important on the initial hitching when you are finding the correct adjustment. Then fire up the engine and watch the car level up. Then take it to a CAT scale and compare the axle weights to the axle weights when unhitched. (This means you have to weigh the car empty and unhitched first.) You’ll probably find you need to increase the weight distribution a little. Most people start with too little on the weight transfer bars.